EghtesadOnline: Iran traded 3.6 million tons of non-oil commodities worth $2.23 billion with the member states of the United Nations’ Eastern European Group during the first nine months of the current fiscal year (March 21-Dec. 21) to register a 29.69% and 33.04% growth in tonnage and value respectively compared with last year’s corresponding period. Latest data released by the Islamic Republic of Iran Customs Administration also show that Iran’s exports totaled 2.01 million tons worth $945.88 million during the period, indicating a 43.97% and 31.84% increase in tonnage and value respectively year-on-year. Imports stood at 1.59 million tons worth $1.2 billion, up 15.18% and 33.94% in tonnage and value respectively YOY. The Eastern European Group, also known as Countries with Economies in Transition, is one of the five unofficial UN regional groups that act as voting blocs and negotiation forums, Financial Tribune reported. Regional voting blocs were formed in 1961 to encourage voting to various UN bodies from regional groups. The group consists of countries in Eastern Europe, the Balkans, the Baltics, Central Europe and the Caucasus, which form the area of the former Eastern Bloc. Europe comprises EEG, the Western European and "Others" group of European states. The group currently has 23 members. The United Nations Regional Groups are the geopolitical groups of member states. UN member states are divided into five regional groups: the African Group with 54 member states, the Asia-Pacific Group with 53 member states, the Eastern European Group with 23 member states, the Latin American and Caribbean Group with 33 member states, the Western European and Others Group with 28 member states, plus 1 member state (the United States) as an observer state. Iran mainly exported liquefied natural gas, pistachios, bitumen, kiwi, apples and polyethylene grade film to Eastern Europe. In exchange, major commodities imported into Iran from the member states included nuclear reactor parts, field corn, sunflower oilseeds, barley, sheep carcasses and radio navigation devices. In terms of total trade value, Russia topped the list of Eastern Europe countries having bilateral trade with Iran. It traded 1.62 million tons of goods worth $1.13 billion, up by 23.29% and 65.29% in tonnage and value respectively YOY. In fact, Russia was Iran’s 10th major trading partner in the world during the nine months. Exports to Russia amounted to 326.72 million tons worth $193.39 million to register a 0.39% and 9.04% rise in tonnage and value respectively YOY. Russia was Iran’s second biggest export destination among the European countries and 21st in the world. In return, Russia exported 1.3 million tons of commodities worth $942.98 million to Iran, up by 31.83% and 74.31% in tonnage and value respectively YOY. The world’s largest nation was the top exporter of goods to Iran among the Eastern European Group and eighth in the world. Major Iranian commodities exported to Russia were kiwi, apples, pistachios, tomatoes and grapes. For its part, Russia mainly exported nuclear reactor parts, field corn, barley and sunflower oilseeds to Iran. Ukraine was the second major exporter of goods to Iran, after Russia, in Eastern Europe and 34th in the world, as Iran imported 173,975 tons worth $79.46 million from Ukraine during the nine-month period, down by 8.37% and 33.68% in tonnage and value respectively YOY. Iran mainly imported sunflower oilseeds, field corn, steam turbine parts and rail equipment from Ukraine. Azerbaijan was Iran’s second biggest trading partner in the Eastern European Group during the nine months, as two-way commercial exchanges stood at 702,062 tons worth $326.91 million to register a 32.74% and 35.49% increase in tonnage and value respectively YOY. Azerbaijan was Iran’s eighth major trading partner in the world during the period. Iran exported 665,807 million tons of goods worth $313.28 million to Azerbaijan, up by 37.19% and 39.14% in tonnage and value respectively YOY. Azerbaijan was Iran’s top export destination in the region and 13th in the world during the period. Iran’s exports to Azerbaijan included liquefied natural gas and iron/steel pipes. Iran imported 36,255 tons of commodities worth $13.63 million from Azerbaijan, down 16.85% and 15.5% in tonnage and value respectively YOY, which mainly included non-alloy iron/steel products, oilcake and barley. Azerbaijan was the 11th exporter to Iran among the member states and 61st exporter to Iran in the world. Mutual trade between Iran and Georgia amounted to 409,745 tons worth $176.96 million, indicating a 63.09% and 50.8% increase in tonnage and value respectively YOY. Georgia was Iran’s third major trading partner among member states and 37th in the world. Iran’s exports reached 391,569 tons worth $128.05 million, up 76.33% and 87.64% in tonnage and value respectively YOY, while Georgia’s exports to Iran were at 18,175 tons worth $48.91 million, down by 41.85% and 2.78% in tonnage and value respectively YOY. Georgia was Iran’s third export destination as well as the third exporter of goods to Iran in the Eastern European Group. The country was Iran’s 25th export destination and 38th exporter to Iran in the world. Bitumen, iron/steel bars and pistachios were Iran’s main goods exported to Georgia, while Georgia exported mainly sheep carcasses, wood and yarn to Iran. Trade with Belarus ($22.29 million), Serbia ($26.13 million) and Croatia ($5.57 million) saw the highest YOY growths of 93.25%, 89.96% and 78.90% respectively, while trade with Lithuania ($3.07 million), Slovenia ($23.52 million) and Romania ($61.82 million) witnessed the lowest declines of 69.85%, 41.81% and 30.93% respectively. Iran’s exports to Croatia ($3.54 million), Serbia ($14.46 million) and Georgia ($128.05 million) saw the highest growths of 281.55%, 88.13% and 88% respectively, while exports to Latvia ($73,518), Lithuania ($1.69 million) and Slovenia ($7.41 million) witnessed the highest declines of 75.33%, 73.34% and 34.91% respectively. 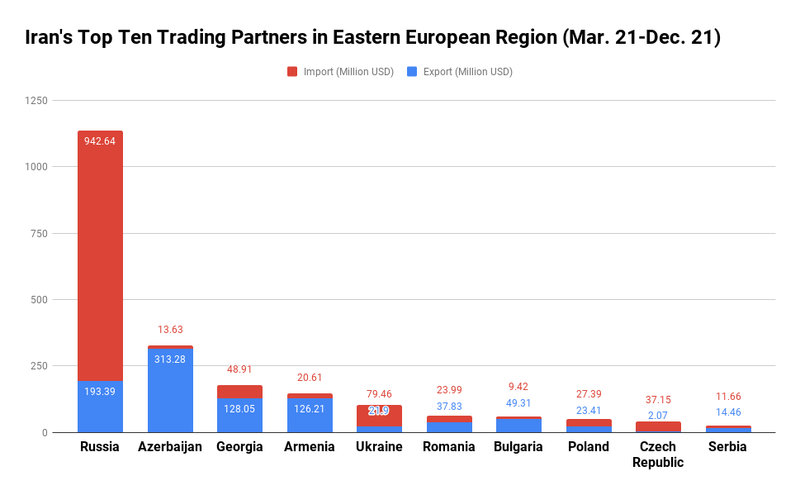 Imports from Belarus ($20.4 million), Serbia ($11.66 million) and Russia ($942.64 million) saw highest growths of 98.81%, 92.27% and 81.17% respectively, while imports from Bosnia and Herzegovina ($75,635), Lithuania ($1.37 million) and Bulgaria ($9.42 million) witnessed highest declines of 76.17%, 64.05% 49.12% respectively.